Da jeg boede i Danmark, var jeg aktivt medlem af Det radikale Venstre. Nu hvor jeg bor i Skotland, er jeg aktivt medlem af Det Skotske Nationalparti (SNP). Det er måske ikke oplagt for alle danskere, hvordan man problemfrit kan gå fra DrV til SNP. Sagen er den, at SNP ikke er nationalistisk på samme måde som fx Dansk Folkeparti. Liberal nationalism, also known as civic nationalism or civil nationalism, is a kind of nationalism identified by political philosophers who believe in a non-xenophobic form of nationalism compatible with liberal values of freedom, tolerance, equality, and individual rights. […] Liberal nationalists often defend the value of national identity by saying that individuals need a national identity in order to lead meaningful, autonomous lives and that democratic polities need national identity in order to function properly. Liberal nationalism is the form of nationalism in which the state derives political legitimacy from the active participation of its citizenry (see popular sovereignty), from the degree to which it represents the “general will”. It is often seen as originating with Jean-Jacques Rousseau and especially the social contract theories which take their name from his 1762 book The Social Contract. Liberal nationalism lies within the traditions of rationalism and liberalism, but as a form of nationalism it is contrasted with ethnic nationalism. Det er nok sjældent, Dansk Folkeparti definerer danskere på den måde! Man kan godt argumentere for, at stort set alle danskere og alle danske partier er nationalister i skotsk forstand, på den måde, at alle anser Danmark som værende den bedste basis for det danske demokrati. I SNP vil vi bestemt ikke udelukke nogen fra Skotland. Vi ønsker blot, at Skotland bliver til et lille nordeuropæisk demokrati, forankret i EU, ligesom Irland, Danmark og Sverige, i stedet for at være en meget lille del af Det forenede Kongerige, der på mange måde har helt andre præferencer end os. Wir Schotten sind offene, freundliche Menschen, wir sind Weltbürger — von daher ärgert mich die deutsche Übersetzung meiner Partei: Wir sind keine Nationalisten. ZDF hat einen interessanten Bericht, “Das Leben der Anderen“, über den dänischen Spitzelstaat produziert. “Zeigen Sie Betrüger an”, heißt es neuerdings auf den Internetseiten dänischer Kommunen. So werden Bürger angestiftet, sich gegenseitig zu kontrollieren und den Behörden vermeintliche Steuersünder und Sozialbetrüger zu melden – und das völlig anonym. 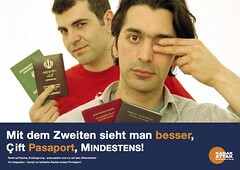 Ich glaube nicht, dass viele Dänen verstehen, wie autoritär der dänische Staat im Vergleich zu anderen europäischen Ländern geworden ist. Ich finde es immer schwieriger das Land, in dem ich aufgewachsen bin, wiederzuerkennen. Lena Meyer-Landrut’s weird English pronunciation (only when she’s singing – when she talking, it’s just normal mediocre school English) has attracted some attention. I went everywhere for you a? w?nt ?f??w?? f? ju? I even did my hair for you a? i?v?n d?d ma? h??? f? j?? I bought new underwear, they’re blue a? b? ?t nu? and?w? ?, ða? blu? And I wore ’em just the other day ?n ? w?r?m d? ?st ð? ?ð? da? Love, you know I’ll fight for you l?v, ju? n?? a?l fa?t f? ju? I left on the porch light for you a? l?ft ?n d? p??t? la?t f? ju? I’m gonna love you either way a?m ??n? l?v ju? i?ð? we? Love, oh, love, I gotta tell you how I feel about you l?v ?? l?v a? ??t? t?l ju? ha? a? fi?l ?baut ju? Some people (at least in Germany and Denmark) have been trying to defend her pronunciation by claiming she’s singing in Cockney (by which I guess they mean Estuary English), but that’s a misunderstanding. It’s true that many native Londoners would pronounce ‘day’ in a way close to [da? ], but like all other native speakers of English, they would make it rhyme with ‘way’, which should in this accent be [wa? ], not [we?]. In the same way, no matter what accent of English you’re trying to speak, you should use the same vowel/diphthong in ‘oh’ and ‘go’. Also, no variety of English that I know of conflates the vowels in ‘light’ and ‘day’. In Scottish English, they are [??] and [e]; in RP, they are [a?] and [e? ]; and in Estuary English, they might be [??] and [??]. The main thing is they’re always different. Finally, of course there are features of a London accent that she hasn’t copied at all – for instance, her /l/s and /r/s sound very German to me. So this is not a case of a German who sings in Cockney; it’s a case of a German schoolgirl with mediocre English who’s copied pronunciations at random from songs she’s listened to. Tschenkéli’s Georgian-German dictionary is in print again! 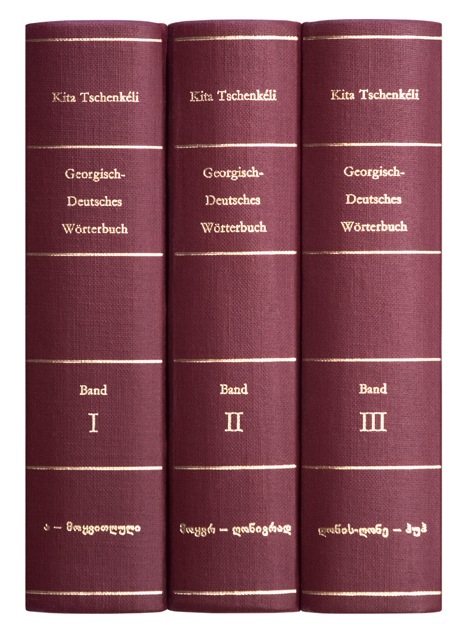 The famed three-volume Georgian-German dictionary by Kita Tschenkéli (???? ???????? ), “Georgisch-Deutsches Wörterbuch”, which is the best bilingual dictionary of Georgian into any language, including English and Russian, is in print again! When I studied Georgian in Tbilisi, my dad had to get all 2508 pages photocopied from the university library’s copy and sent to me because it was absolutely essential but impossible to buy anywhere. 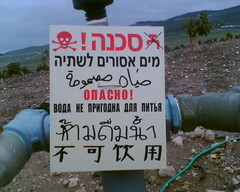 The price is €145, which is really quite cheap for this type of work. The only reason I’m not ordering it is because I still have my prized photocopies. They’re also selling his excellent Einführung in die Georgische Sprache at €75. This is not essential in the same way, but it’s definitely worth having if you’re serious about learning Georgian. I don’t own it, but I’ve spent many happy hours with it in the library of the Department of Linguistics in Aarhus. Author thomasPosted on 2010/03/04 Categories de, en, ka, linguistics8 Comments on Tschenkéli’s Georgian-German dictionary is in print again! Where can I buy food-grade caustic soda? 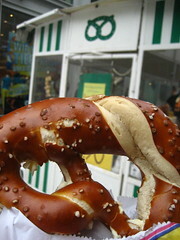 In southern Germany, Brezeln are a beloved type of bread. Being half Swabian myself (and the great-grandson of Stuttgart’s best Brezel baker), of course I miss them, and I would love to be able to bake them myself. I’ve sometimes baked some with Miriam (my sister), boiling them in a mixture of natron and water, and although the taste was OK, they didn’t get the proper dark-brown colour. However, I’ve now found a recipe that looks like it might be just what I’ve been looking for. However, when I googled caustic soda, all the shops that sell it in the UK (such as Boots) seem to be selling it as a drain cleaner, and I have my doubts it’s really food-grade caustic soda. Author thomasPosted on 2009/11/30 Categories culture, de, en, fooddrink15 Comments on Where can I buy food-grade caustic soda? Så Folketinget har igen stemt et forslag om dobbelt statsborgerskab ned – heldigvis med mit parti på den rigtige side. Det ser dog ud til, at flere partier er ved at flytte sig, så måske går det igennem næste gang. Hvad mener manden dog? Familier er da noget af det mest sammenbragte. Selv om man som barn måske nok betragter sin familie som én enhed, er ens kærestes eller ægtefælles familie en fremmed familie, der bliver ens egen med tiden. Går Søren Krarup ind for, at man ved ægteskab skal vælge klart mellem den familie, man er født ind i, og den familie, man gifter sig ind i? I stedet for at blive en del af dem begge? Det er jo netop det, der er pointen ved dobbelte statsborgerskaber! Jeg er tysker, jeg er dansker, jeg er skotte. Hvorfor (og hvordan) skal jeg vælge én nationalitet?